Every nail artist has at least one glitter nail polish in his or her stash. It’s just not possible to not have it. I have multiple, mostly from old brands that no longer exist so the glitter base has dried out and they are unusable. I miss the old Milani and Sephora by OPI but I hold on to the bottles just in case one day…these brands return! They probably won’t but I can dream, right?? Speaking of, I used one of those old SOPI polishes in today’s look. A simple glitter gradient that reminds me of all the blood that leaves my body through draws, diagnostics and IVs. How lovely! Glitter gradients are one of the most arthritis friendly nail art techniques. You can either apply glitter directly with the nail polish brush or, for more exact placement you can use a large soft makeup wedge sponge. If your arthritis is under control you can even use a foam tip eye shadow applicator for even more precision! …more nail art than I can handle!!! I am interested in at least four separate nail art challenges, one swatch and one Rheumatoid Arthritis challenge!…and I am trying my hardest to post as much as possible to Instagram. I took a lot of time from the blog because I became unhappy with my views. I averaged less views per post than when I even started the blog. I lost interest. People are moving from reading to viewing. My Instagram account stagnated and only acquired followers after I posted video tutorials. I will post to the blog. I love writing (however horrible I am at it — never my strong suit in school) and I miss it. This blog, no matter how unpopular is my personal space to write, be creative and not care what other people do or think. 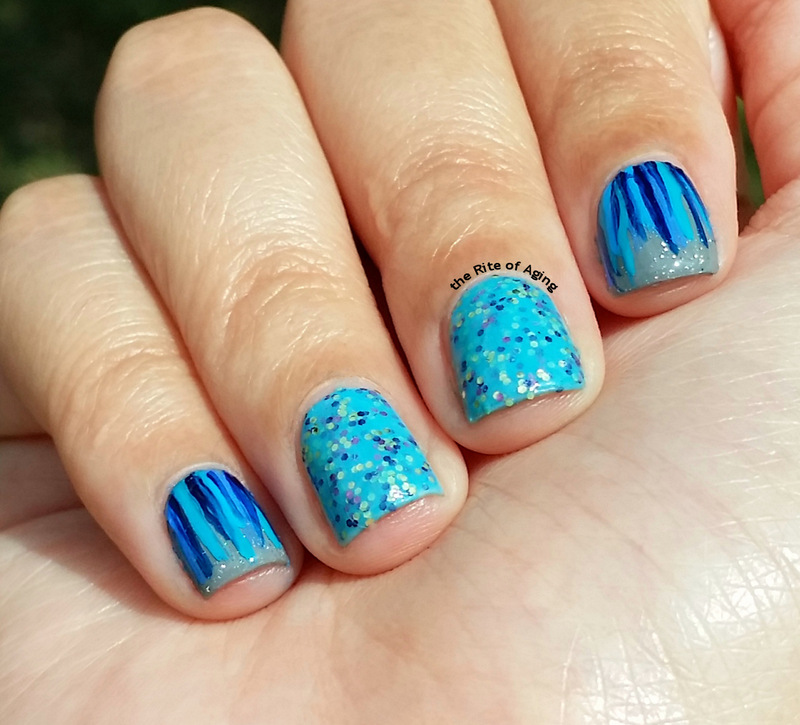 With that in mind, take a look at my first nail art of the month! I created this look for the Challenge Your Nail 12 Days of Christmas challenge. The first prompt is Silver & Gold. I have taken part in the Challenge Your Nail Art 12 Days of Christmas challenge since 2013. Jessica from “Be Happy and Buy Polish” (check out her awesome swatches here) used to host but her family grew in recent years so she took a step back from her many nail-related duties to focus on her home life. Edit: Unfortunately, the CYNA 12 Days has not taken place in a couple of years but it was fun while it lasted! Glitter: SinfulColors All About You*, Sephora by OPI Lights, Glammer-a, Action! I am TOTALLY off my nail art game which makes me really upset because I love Christmas and holiday nail art more than anything! I finally got some of my mojo back for the “Christmas is Coming” prompt but I am still not up to my usual standards. I confused my nail art challenges and “Christmas is Coming” is part of the Clairestelle8challenge on IG! I won the Formula X Nails Infinite Ombre kit from an Instagram giveaway and I honestly never thought I would use it nearly as much as I do. I thought the sheer polish trend was cool but was never interested enough in it to pursue it further. I like the colors in the kit and I like how well they blend together. However, they are a bit thicker than typical sheer polish which for me, is neither here nor there. Can you believe I forgot I own “Holiday Rebel” by SinfulColors?? It is the perfect holiday glitter and I pushed it back into the cabinet over the year. I finally dusted him off, apologized profusely for neglecting him and eagerly dabbed him on my nails. I need to find a use for this very awesomely secular polish. Otherwise, I’ll use once, twice maybe thrice tops, which is far less than he deserves. For today’s glitter prompt I went with an oldie but a goodie: a simple gradient. I have actually done this look before but on serious nail nubs. Can we talk really quickly about my nail length? I always always always since the beginning of my time had short nails. It was impossible to wear long nails because of rock-climbing and my vet tech work. I was so used to short nubs even going a little longer felt strange and I always thought my nails would break. As my blogging progressed I started favoring longer nails (I know they are still considered short but for me these have serious length!) I can still climb and work but how times have changed. What’s next? Changing my nail shape?? 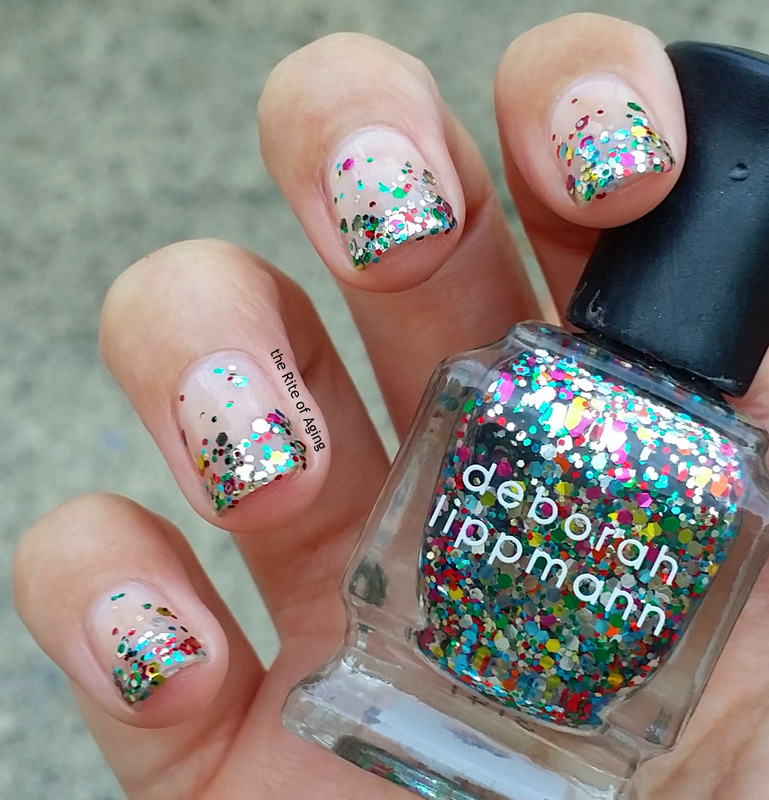 Glitter: Deborah Lippman Happy Birthday! 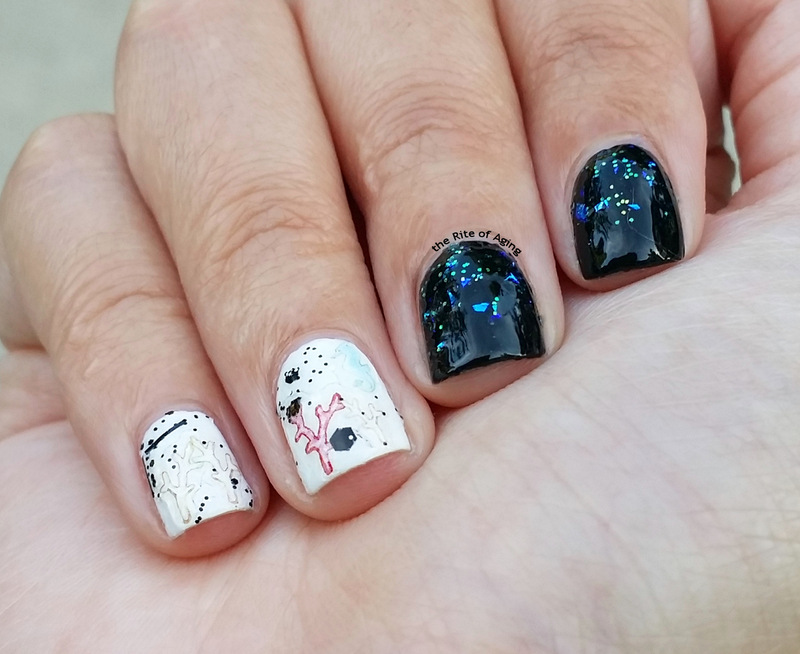 (The first photo is my first attempt, the second is my actual black and white nail art for the 31 Day Challenge). For today’s black and white prompt I attempted two different designs. At first, I wanted to incorporate the #31DC2015 and #clairestelle8sept challenges into one look. I recently received a set of beach stickers from Born Pretty Store which I thought would be perfect! Unfortunately, these stickers did not perform well. They were easy enough to use. I peeled off the stickers with tweezers and applied them to my nail. However, I had difficulty laying the stickers flat and even after top coat application I could see the edges and any air bubbles trapped underneath. I would recommend using these with light, already top-coated base colors. Beware, if the base is still tacky and you re-position the sticker, it will bring the polish up with it…These remind me of the cell phone screen protectors!! 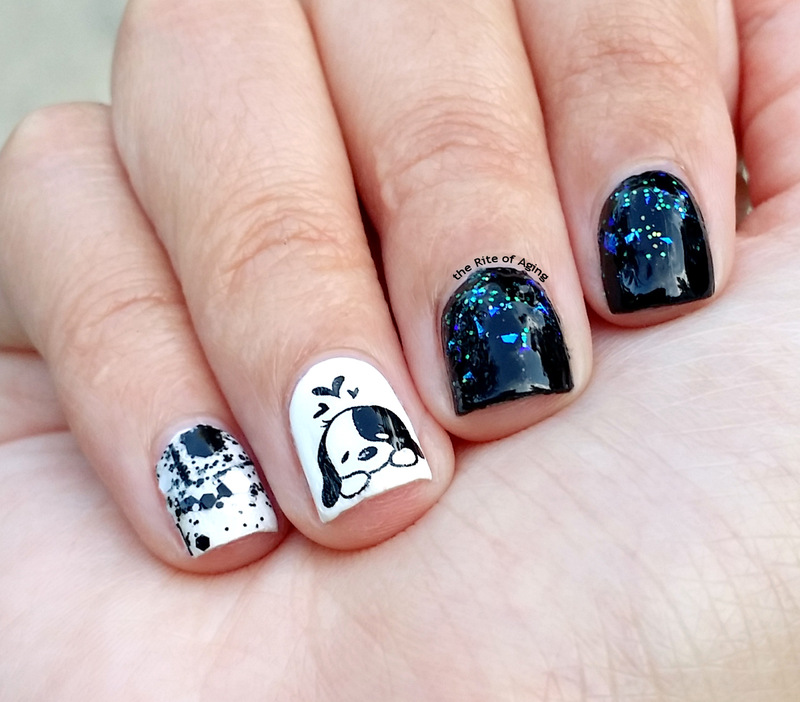 They are extremely easy to use but I would prefer to stick with the BPS brand water decals. Stickers: Born Pretty Store Magico Brand Stickers ($3.69/1 sheet linked here). Since these are not the BPS brand nail art decorations they are a little more expensive than what we usually see from them! The above look did not turn out at all the way I wanted so I stripped the white nails and re-did them. Hope you like the final look! We are only five days in and I already hit nail artist block?? I tried five different designs and none of them looked right! I racked my brains, I skimmed through old photos and I met with absolutely no inspiration. I realized this morning most of the looks I did in August were all blue! No wonder! I am burnt out. Hopefully if I lay off the color I will recharge my blue batteries. I did not necessarily want to do this design but I couldn’t do anything else. I pulled out some old polishes I had not used in a while. I forgot how much I love the Nails Inc. glitter. The colors shouldn’t work together but they do somehow!